Whether as a business owner or governor, Tom Wolf is a leader consistently taking on the status quo and trying to help middle class families. Tom is a different kind of leader, and he has been a different kind of governor. Download a high resolution portrait here. Before he was governor, Tom was the owner of the Wolf Organization, a distributor of lumber and other building products. Tom bought this family business and grew the company — eventually more than quintupling the business in size. He did this with smart leadership and by treating his employees fairly, even sharing the company’s profits with workers. Since he took office in 2015, Tom has fought to change Harrisburg. On day one, his first actions as governor were signing a gift ban prohibiting administration employees from accepting gifts from lobbyists and reforming legal contracting to end pay to play. Tom also donates his entire salary to charity and refuses a state pension. When Tom took office, he inherited an education system that had been cut by one billion dollars that led to teacher layoffs, cuts to programs like pre-k and tutoring, and larger class sizes. Rather than make Pennsylvania’s children the first casualty of the budget process, Tom made our children and our future our top priority. 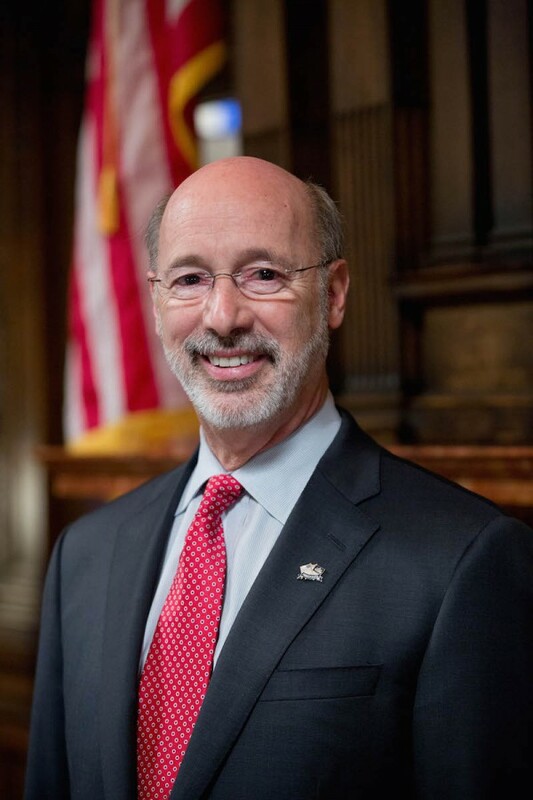 He has now restored the one billion dollar cut to education made in the previous administration, leading to improved graduation rates and more children in pre-k.
By expanding Medicaid, Tom provided quality, affordable health care to 720,000 Pennsylvanians. He has also given more than 50,000 seniors the opportunity to age in their homes and made Pennsylvania a national leader in fighting the opioid and heroin epidemic by expanding treatment options and ensuring law enforcement and first responders have the resources they need. Tom is working to grow our economy by making it easier for small businesses to start and expanding career and technical education opportunities. He is fighting to make sure wages keep up with the cost of living, focusing on skills training for kids who do not go to college, helping small businesses, and rebuilding Pennsylvania’s infrastructure. While finishing his PhD, Tom worked as a forklift operator and warehouse worker in the family business, the Wolf Organization, a distributor of lumber and other building products based in York, Pennsylvania. After graduating, his first full-time job was running a Tru-Value hardware store in Manchester, Pennsylvania. He later went on to buy his family business. Tom’s leadership philosophy is an extension of his lifelong investment in community development. In addition to serving on and leading the boards of numerous organizations dedicated to education, health, welfare, economic development, culture, and the arts, Tom has rolled up his sleeves to help build a Little League baseball field in his community, volunteered in soup kitchens, and painted a local school. Tom and Frances, his wife of over 40 years, still live in York County and have two grown daughters, Sarah and Katie. In 1985, Tom and his cousins took a risk by securing a loan to buy the family business. Over the course of 25 years, they grew the Wolf Organization into a successful business — eventually more than quintupling the business in size. In 2006, Tom sold the business and took the job of secretary of revenue in Governor Ed Rendell’s cabinet, where he instituted reforms that grew and strengthened the state lottery and laid the foundation for millions of dollars in additional benefits for Pennsylvania seniors. In early 2009, in the depths of the recession, Tom returned to the Wolf Organization — the family company he had spent more than two decades building and growing — when it was on the brink of bankruptcy. Tom immediately ended his 2010 gubernatorial campaign, bought back the business, and got to work reinventing the company. Through innovation and smart investments, Tom was able to turn the company around. He changed the Wolf Organization’s business model, transforming it from solely a supplier of other businesses’ products into a company that sources its own American-made cabinets and competes directly with overseas manufacturers. Tom also made stronger investments in his employees because he knew that it was their work that truly made the Wolf Organization successful. So at a time when many businesses were cutting benefits, Tom continued to provide his employees comprehensive health and retirement benefits and continued returning 20 to 30 percent of the company’s profits back to workers. On January 20, 2015, Tom was sworn in as Pennsylvania’s 47th governor. Since taking office, Tom has taken a number of steps to make Pennsylvania a better place and is fighting for Pennsylvanians in Harrisburg every day. Tom is working to grow our economy by making it easier for small businesses to start and expanding career and technical education opportunities. He is fighting to make sure wages keep up with the cost of livings, focusing on skills training for kids who do not go to college, helping small businesses, and rebuilding Pennsylvania’s infrastructure. Tom’s economic development team has completed relocation and expansion projects throughout Pennsylvania, like a major Fedex expansion in the Lehigh Valley, a large Amazon expansion across Pennsylvania, the investments in the Philadelphia port, and the Shell Cracker plant in Western Pennsylvania. To help grow manufacturing in Pennsylvania, Tom created a tax credit for manufacturers who create jobs in Pennsylvania. Tom has also cut taxes for small businesses, and he is implementing a plan to reduce bureaucracy and red tape to make it easier to start or expand a small business in Pennsylvania. When Tom took office, he inherited an education system that had been cut by one billion dollars that led to teacher layoffs, cuts to programs like pre-k and tutoring, and larger class sizes. Rather than make Pennsylvania’s children the first casualty of the budget process, Tom made our children and our future our top priority. He has now fully restored the one billion dollar cut to education made in the previous administration, that has led leading to improved graduation rates and more children in pre-k.
Tom’s investments in education also mean more kids can attend pre-K and more students have access to art, music and advanced placement programs which had been disappearing from our schools in the previous administration. As a former business owner, Tom knows we need a strong workforce. New businesses will only come to states that invest in education. That is why Tom is also expanding apprenticeships and instituting policies to bring more computer science courses to public schools. Tom continues to advocate for increased funding for Pennsylvania schools to deliver high-quality education to every student across the state, regardless of zip code. We must make investments to adequately and fairly fund our education system in order to lay the foundation for long-term economic growth in Pennsylvania. As governor, Tom took immediate actions to provide health insurance to more than 720,000 Pennsylvanians by expanding Medicaid and has reduced the commonwealth’s uninsured rate to the lowest it has ever been. Tom has also made fighting the opioid crisis a top priority of his administration and is continuing to work with medical professionals and law enforcement to address this public health crisis. Tom provided funding to implement treatment centers throughout the commonwealth and has expanded access to treatment for thousands of Pennsylvanians with substance use disorder. Under his leadership, Pennsylvania launched a prescription drug monitoring program that will allow prescribers and dispensers to query and report information regarding the number of opioids prescribed and to whom, and recently announced new prescribing guidelines for the safe and effective use of opioids. Tom is fighting to change Harrisburg. He donates his entire salary to charity, refuses a state pension, signed an executive order prohibiting administration employees from accepting gifts from lobbyists, and reformed legal contracting to end pay to play. Tom eliminated two billion dollars of government waste and redundancy from the state budget by reducing bureaucracy and consolidating state agencies so that he could protect his investments in education and protecting our seniors. And he has improved customer service and efficiency by creating an office dedicated to holding state government accountable and demanding change. Tom has always been a different kind of leader and he has brought this experience to his role as governor. Since day one in office, Tom has fought for the people of Pennsylvania in Harrisburg.